Whether you’re new to campus or returning from summer break, we welcome you to the libraries. Ready for an introduction to library resources? 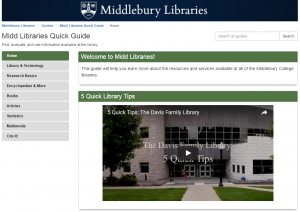 You’ll find all the advice you need to get started in the Midd Libraries Quick Guide. Want a deeper look at our collections? There’s a guide for every subject at http://go.middlebury.edu/guides. This entry was posted in libspotlight, Middlebury Community Interest, Post for MiddNotes, Post for MiddPoints and tagged Library Spotlight on September 9, 2016 by Carrie Macfarlane.